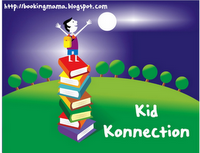 Most of us are curious beings, especially kids, which is why books such as You Asked? Over 300 Questions and Astounding Answers are popular. So much so that OwlKids had reissued a 35th anniversary edition. My kids were thrilled when they got it. It's filled with questions many of us never ponder on but once asked stirs our curiosity. For example: What makes your stomach growl? Why does hair turn gray as people get older? What happens when you get the hiccups? Why are storm clouds gray, while other clouds are white? Why do apples turn brown after you cut into them? 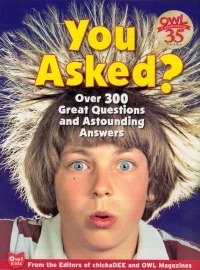 These are all questions kids have sent in to chicaDEE and OWL magazines over the past 35 years and compiled into this book. It's divided into 4 sections that cover questions about space, technology, nature and the human body. The book is filled with beautiful full-page photos and cartoon drawings. It's an attractive book that gives concise answers, turning even complex scientific facts into fun reading. And making this book both entertaining and educational. In fact I found this book so visually appealing that I used it in my day program with seniors who are in the first stages of Alzheimers. It was a hit. The photos and questions made for a whole hour of learning, reminiscing and stimulating discussion. A good amount of laughter too. If you have middle-grade kids who are into learning fun facts, this book will definitely be a winner. It is great as a springboard for science projects and family fun night. Throw it into the car on long drives and slip into the tote bag for sleepovers. It's great for reluctant readers too. Or for grandparents to share with their grandkids and vice versa. Highly recommended. Disclosure: Thanks to Owlkids Books for sending us this book for review. We were not compensated in any other way, nor told how to rate or review this product.